The Exodus story teaches us of our covenant relationship with God. Each time the people grumbled, Moses prayed to God, and God responded faithfully to his covenant love commitment. 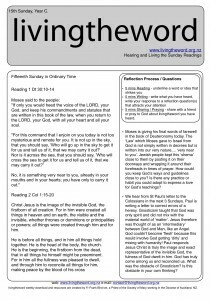 Remembering the first reading is chosen to highlight the Gospel reading, John 6 and Exodus are both reflecting on the meaning of the Jewish ‘Passover’. The treasured memory of God feeding his people with ‘manna’ (literally from the word ‘man hu’ meaning ‘what is this?’) was an essential part of the passover celebration. Rather ungratefully, God’s people continually grumbled. Do I grumble frequently against ‘Moses and Aaron…..’ How could I speak words of ‘affirmation’? How could I practice gratefulness for the ‘daily feeding’ by God of every gift and blessing? Parts of the Letter to the Ephesians are prayers used at Baptism in the early church community. A colorful image is pointed to in the Baptism ceremony. In ancient times one’s clothing was considered part of oneself. In the ceremony you took off your old clothes and put on a new white garment. Your old self was put aside. Your new self is the life of Christ. Your new life-style is as a citizen of Heaven not a citizen of Rome. How could you show Righteousness, Holiness and Truth more in your life? Amongst your family? At work? 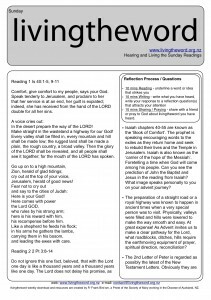 Last week we began 5 weeks of hearing the Gospel of John chapter 6. It is important to notice the context of John 6. The famous ‘bread of life’ passage is the second of three passover celebrations in the Gospel of John. At each passover, Jesus replaces the passover with his own ‘body’ (see John 2, 6, 19). Last week the crowd tried to take Jesus away to make him ‘King’ because there was a Jewish expectation (2 Baruch 29:3,18) that there would be a miraculous feeding of bread from heaven which would reveal the promised Messiah. Jesus comments to the crowd, they are only looking and working for ‘food’ to fill their bellies. He promises something greater. Can you understand what Jesus is doing when he claims he is the ‘Son of Man’, the one on whom the Father, God, has ‘set his seal’? What does it mean if you ‘set your seal’ upon your letter, object…? The crowd asks for proof from Jesus that he is ‘better’ than Moses who fed Israel with ‘manna’ in the desert. Jesus responds using a very important phrase: ‘I AM the bread of Life’. I AM is the divine name given by God to Moses in Ex 3,16. Jesus reminds the crowd that it was God not Moses who fed his people, and in fact, I AM is standing right in front of you. The Gospel of John often requires the reader to step down into deeper levels of meaning. Never hungry and never thirsty recognises a physical ‘hunger’ and invites the reader to recognise a deeper spiritual hunger and thirst for life. Beyond feeding your body and satisfying your thirst, what do you really live for? What is ‘life’ for? Many people came seeking Jesus but they did not want to follow him. Jesus will soon make the connection that He is and will become the ‘bread of God’ from Heaven which gives life. He will do this with the gift of his ‘Body’ and his ‘Blood’ on the cross which will be received in the celebration of the Mass John 6, 55. Do you ‘see’ that you truly receive Jesus at Mass? Do you ‘seek’ AND ‘follow’ Jesus?